SCENE®, an entertainment rewards program, was launched by Scotiabank and Cineplex Entertainment in 2007. 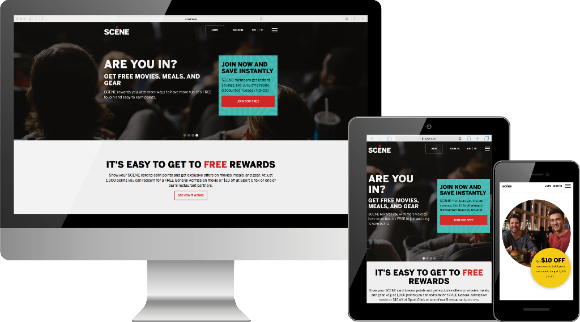 With more than eight million members across Canada, SCENE enables members to earn and redeem points for movies and concessions at any Cineplex Entertainment location, for dining at CARA restaurants and for shopping at Sport Chek stores. Members can also accelerate their earning power with the SCENE® ScotiaCard® debit card and SCENE® VISA card. In 2016, SCENE was in the process of a major rebrand and wanted to launch a new website. They were also hoping to find a platform that was flexible and that allowed them to increase their speed to market of content and updates. SCENE was looking to become more agile in getting content and design updates live on the SCENE website. They wanted a system that was simple to use and that they could administer themselves efficiently and effectively with internal resources. In addition, and like many businesses at the time, they maintained a separate mobile version of the SCENE website, m.scene.ca. This allowed them to optimize for the influx of mobile traffic they were seeing on the site. Over time, however, this mobile site became difficult to manage and SCENE quickly found that their desktop and mobile sites were two conflicting strains on their resources. By 2016, mobile traffic was accounting for more than half of all traffic, and SCENE knew that a single site with a mobile-responsive design was the answer. The SCENE team was also planning on launching a new mobile app and they wanted to be able to update app content themselves, using the same CMS tool as their desktop site to ensure consistency. They were aware of the need for a mobile-first strategy and wanted to ensure that their members were able to access the site in the most convenient way possible, whether via their desktop computer, mobile browser or mobile app. Finally, as part of their long-term strategy, SCENE wanted to build a site that was scalable and that would be able to accommodate future business needs and technologies. SCENE chose to work with Agility based on our ability to customize their site to their exact needs, as well as our flexibility with integrations. As part of the website rebuild, we worked with the SCENE marketing team, a design agency, a mobile app builder and the SCENE’s platform partner. One of the main benefits of the Agility solution was our customized and flexible integration with the platform host. While backend data is still housed by them, all content can be delivered and updated from the Agility platform, which means that SCENE now has full control over their offers and rewards. In terms of the website and mobile app, our platform has enabled SCENE to easily and intuitively update all content whenever needed, with no technical skills ever required. The big benefit about managing all content from one hub is that there is no need to make updates multiple times (on their desktop, mobile and app sites and their kiosks); content is automatically updated across the board. "One of the main benefits that we are able to realize by using the Agility CMS is the ability to build a piece of content once - like a member offer or reward - and then display that content in any digital channel, such as the website or mobile app. This means we build it once, in one system, and it looks the same across these channels. From an administrative standpoint this is huge, and from a member standpoint we can ensure that the content is the same in every digital channel." Another important element we took into consideration when building SCENE’s new website and mobile app was ensuring that we built a framework that could accommodate not only today’s design capabilities and technologies, but also future ones. This is reflected in the site’s content architecture, which was specifically tailored to SCENE’s unique business needs and requirements and built with scalability in mind. "We were very pleased with the level of commitment from the Agility team. The team went above and beyond to ensure they were able to do what it took to allow us to hit our deadline. It was impressive how collaboratively they worked with our other agencies and with our internal team." Agility has given SCENE full power and control over their content, enabling them to better manage their digital channels and provide their customers with an improved online experience. Customers are now able to access all membership information through their desktop site, mobile site or mobile app, including transactions, account history, personalized offers, point balances and point redemption. Content is easy to update instantly through Agility and data across vendors is automatically delivered. SCENE have cited the ease of use of the Agility platform as a top benefit thanks to its logical and intuitive user interface, which non-technical members of their team find easy to use and to publish content on. This has allowed them to easily populate the site and to deliver content quickly and efficiently. Slow speed to market of new designs and content. Overreliance on external content managers and web designers. Difficult-to-manage mobile website separate from their desktop site. Plans to launch a brand new mobile app. Need for a scalable solution to accommodate future needs and technologies. Highly customizable website tailored to SCENE’s unique needs. Easy and intuitive updates with no technical skills ever required. Full control over content, offers and rewards. Automatic content updates across all channels (desktop, mobile and app). Seamless and flexible integrations with SCENE's platform host. Scalable site and content architecture, ready for any future needs and technologies. Full power and control over all site and app content. Easier-to-manage digital channels, with data across vendors automatically delivered. Easy-to-update content across the board through Agility. Improved online experience for SCENE’s customers. Ability for customers to access all membership information through multiple channels. Logical and intuitive CMS platform that non-technical members of the SCENE team find easy to use.